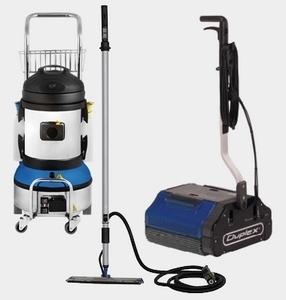 We look at carpet steam cleaning equipment and machines that can be used in your home, office or factory. This article will detail all of your options so you never have to make an uninformed choice ever again! There are simply hundreds of different brands and models of Carpet Steam Cleaning Machines available. • Portable/ Hand Held: These are for light everyday household use such as cleaning or sanitizing toys, utensils, mirrors and other small objects. • Steam Mops: These are for cleaning floors which include hard floors like tile, marble, ceramic etc. • Mid Range Steam Cleaners: These are the models that you can use just about anywhere around the home. This is the most popular category as you can use them to clean your floors, carpets, windows, grills, patio furniture, bathroom surfaces, grout, kitchen surfaces and anywhere else that your imagination carries you. These are the main models which are highlighted on Amazon and offer great value for your money. • High Range Steam Cleaners/ Semi Professional: These models are a hybrid of the home steam cleaners and professional range steam cleaners. These are for the home owner that wants a deep clean and is very strict about their home’s sanitation. These models are a lot more powerful, they deliver more steam at higher temperatures and pressures and offer more in the realm of cleaning technology. They can also be used in small offices and businesses. Brands include Ladybug and Vapor Clean. 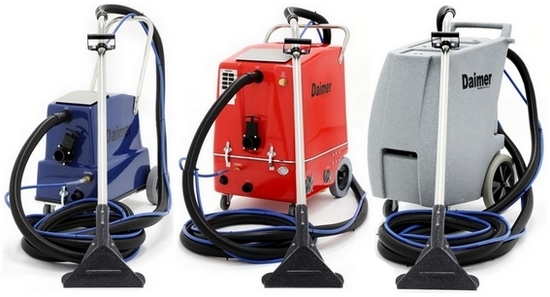 • Professional Steam Cleaners: These are a half step up from the Semi Professional type of steamers. In this article we will have a look at the Commercial and Industrial strength carpet cleaning equipment. We have more than adequately covered the hand held, mid, high range and professional level steamers and you can check out some of our carpet steam cleaners ratings for steamers that fall into this range. This company which originates in Australia is one of the leading distributers of carpet extractors, carpet cleaning equipment, truckmounts and other carpet cleaning tools. Steambrite is well known for their Mytee series of carpet and floor cleaners. These machines are powerhouses and will break up grease and caked in dirt with very little effort. Customers sings the praises of the impressive suction power, the short drying times, the ease of use and the overall quality of the Mytee machines. The second company we will look briefly at is Duplex. This company can provide a wide range of cleaning products for all your professional and industrial needs. They have specially designed cleaners for cleaning restaurants, hotels, caravans, campsites and much more. Do you have a restaurant? Then you might want to have a look at the Duplex’s Jetvac Professional and Thermoglide steam mop. These two products are all you need to get all the floors and surfaces in your restaurant completely cleaned and sanitized. You can compare these 3 models (and more) side by side here.